This article was originally published in the Project Grow Community Gardens newsletter and is reprinted here with permission. Have you ever heard of a pawpaw? Hamtramck, Michigan, resident Michael Davis hadn't until this past September. From the first moment he tasted the rich blend of mango, banana, citrus, and melon flavors of the pawpaw, Davis was hooked. A visit to Davis' home clearly shows his passion for growing things in an environmentally responsible way — an approach he calls "ghetto gardening." The hardscaping is comprised of stacked, reclaimed concrete chunks, former red sandstone, Detroit curb stones, and plant life. He rescued plants he found on empty lots while on bike rides around the city. Now, irises, daylilies, pachysandra, lilacs, and hostas all find their home on his land. Despite the name, it all comes together to create something far from "ghetto." Over the years, Davis has watched his little corner of Hamtramck change. The number of vacant houses on the street increased and the police made their fair share of visits down the one-block deadend street. But his passion for the quirky little city has kept him from simply walking away. With the taste of pawpaw fresh in his mind, it clicked. Why not? Davis — along with Julie Swartz, Robert Swartz, Evan Major, Stephen Gach, and a growing number of supporters — are bringing a reduce, reuse, and revival approach to six long-vacant, city-owned lots with the pawpaw playing a major role. And so Hamtown Farms was born. It will one day grow more than 150 pawpaw, pear, and hazelnut trees. When complete, it will also have more than 50 raised community gardening beds for residents to grow seasonal vegetables. In addition, the project will include a large open public space that will accommodate a wide variety of community events including a Harvest Festival in mid-October. stock. Photo by Julie Swartz. Over the past few months, the group has been hard at work researching pawpaws – drawing from the work of Neal Peterson of Peterson Pawpaws, Dr. Ron Powell of the Ohio Pawpaw Growers Association, and Dr. Kirk Pomper of the Kentucky State University Pawpaw Research Program. Their study has found the right mix of varieties creates the best fruit yield, hardiness, fruits per tree, ripening time, and more. A recent trip to a nearby wild pawpaw thicket netted the group more than 500 seeds that are currently stratifying in a refrigerator. Chip bud grafting of known varieties including 'Overleese' and' Sunflower' to 2-year-old rootstock from these wild collected seeds will go a long way in ensuring hardiness. The group may have also stumbled upon a three-seeded variety, though it will be a few years before this new variety, temporarily named 'Bob’s Beauty,' can be confirmed. Members of Hamtramck's local government including Mayor Karen Majewski and Jason Friedmann, Director of Community and Economic Development, are equally excited about the project. A number of relationships are also beginning to sprout between Hamtown Farms and area businesses and organizations including The Fruit Tree Planting Foundation, the National Pawpaw Grower's Association, the Green Garage, People’s Community Services, Roots to Fruits Ecological Design, Project Grow Community Gardens, and others in order to help regrow this little corner of Hamtramck. One of the plots at Hamtown Farms. 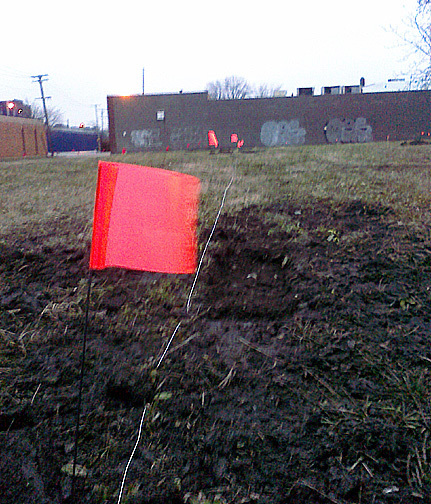 Hamtown Farms now consists of two plots that span nine vacant lots along Wyandotte Street. The group is allowed to use the land through a garden/lot cleanup permit granted by the city of Hamtramck. If you happen to own or have access to a bobcat with a 12-inch auger, a large supply of concrete chunks, or a good source for topsoil, they'd love to hear from you. To learn more about the project or for more about North America's largest natively grown fruit, the pawpaw, write to hamtownfarms at gmail dot com. They'd love to share their proposal and hear your thoughts. I have heard of pawpaws before. In fact, there is actually a small town in Illinois named Paw Paw. I stopped there once for gas on a trip up north; I've always wondered if it got its name from the fruit. Thanks for sharing this story, Monica. What a great way to use land that is being wasted, not to mention a great way to bring community members together. I hope it inspires other communities! It's amazing what can be done with vacant lots or even front lawns if the will and imagination are there. Isn't that all, altogether, extraordinary! I believe pawpaws and papaya are the same fruit?? Great idea to reclaim unused land for gardening. Planting native trees is excellent for the environment. Toronto's Urban Forestry Services plants trees on City owned street allowances fronting residential properties for free. Last spring I selected two Service-berry trees for our front yard. After planting, both small trees flowered a few month later. In the fall the first robins arrived to feed on the berries. Very soon they will bloom again. Although there are some people (mainly Australians) who call the papaya "pawpaw," this is not the same fruit. The pawpaw that is native to the eastern woodlands of the U.S. is Asimina triloba Annonaceae. The papaya is Carica papaya L.Caricaceae. Das klingt ja alles sehr interessant Monika. Ich bin gespannt, ob ich bald einmal pawpaws in Bayern probieren kann. Oder doch Papaya??? I have never seen a Pawpaw tree or eaten the fruit. Great profile and thanks for highlighting its use in vacant lots. So enjoyed this informative post, dear Monica. Your blog is lookin' as spiffy as you are! I've always loved the sound of the name Hamtramck! Really enjoyed this post Monica. I don't think I've ever seen a Pawpaw. Kudos to Davis and the entire group reviving their neighborhood and turning vacant lots into local food production! An excellent share that brings hope to some of the problems we are experiencing in urban neighborhoods. Thank you!